Now I'll get back to some sewing... 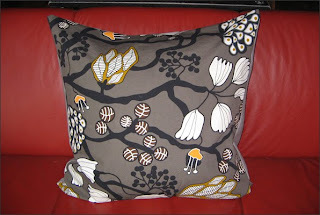 I want to get those darn pillow covers done this weekend! 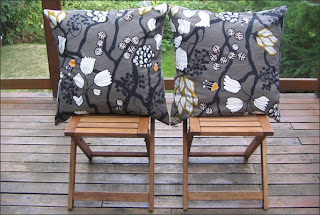 I finished off the set of 26" x 26" pillow covers last night that I started this weekend. I trimmed the cover by an inch so it wasn't too roomy. They look gorgeous... And the good news is I have enough fabric left for a second set! I also have a bit of fabric left that I may use for one of the wall organizers I want to sew in the next while. So my $7 drape created four 26" x 26" pillow covers, two chair seats and then a wall organizer... That's a good deal! I'm deep into recycling this week. My sewing buddy, Thelma, gave me some wool blankets for sewing. The blankets were a bit damaged so she had cut them into pieces then when she moved donated them to me. They're nice bright colours! 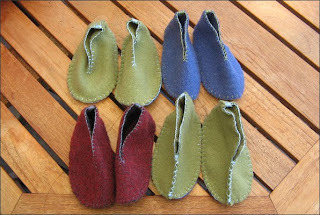 I have some booties I'm making - I still need to do some felt applique. They red booties are from a red scarf I bought for $2. 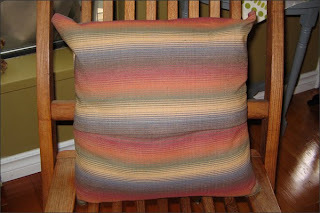 I think I'll also make some pillow covers using the material from the wool blankets. My other recycling projects involve a gorgeous drape I bought this week at the Salvation Army for $7. 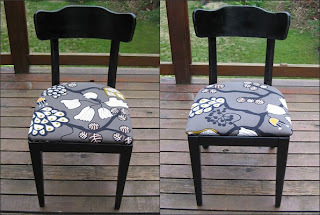 It's made with funky Ikea fabric. I spent a bunch of time unpicking the drape and today I sewed one 1 pillow cover for a couple of 26" x 26" pillow forms I have. I just finished sewing and now have to re-jig the cover since it's huge! 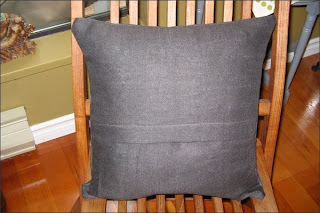 I'll need to shave off an inch all the way around then sew pillow cover #2. 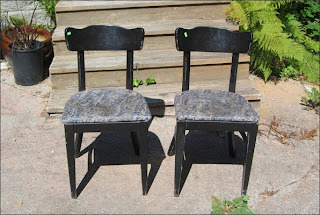 I'm also reupholstering these chairs with the Ikea fabric. I bought them at the Salvation Army for $5 each. I thought it would be a quick and easy update since I just needed to touch up the paint then replace the fabric on the seat. No such luck. I removed the fabric on each seat only to find there was 3 layers of fabric underneath. Brutal. So I was able to get 2.5 layers removed yesterday. Today I'll remove the rest then add the Ikea fabric. They'll look FAB once I'm done. It's been a good day! I volunteered at the Happy Cat Haven sale for a couple of hours this morning. I mainly helped them unpack all of their items from the storage locker. 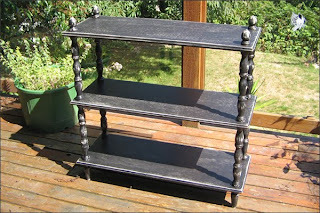 Then when I got home, I finished my shelves from the dump. Yesterday I worked on the shabby chic look then today I sealed them. They look a lot better now! Not bad for $1! I picked up these salt and pepper shakers at the Salvation Army yesterday - it's been a slow week for kewl thrift store finds! They were $2.50. 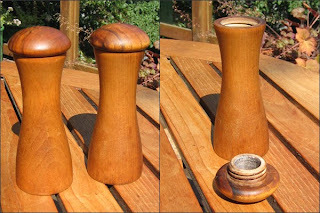 They're from Italy and a lovely simple wood design. 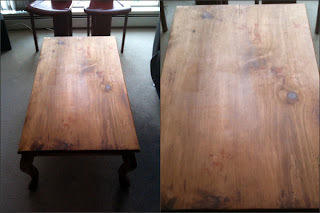 I sanded them then wiped olive oil on them. 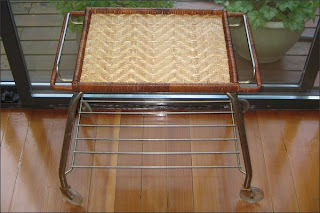 I love items like these - simple, functional and made of quality material. 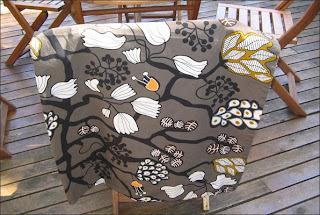 Here's the fabric for my teak lamp shades. Now I just need the lamp shade frames plus glue, etc. 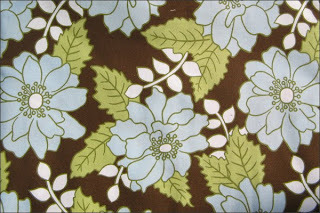 I've also picked out the fabric for the mahogany floor lamp I'm refinishing. I'm waiting for the fabric to go on sale at Fabricland. Gotta love those 50% off sales! Thanks to Thelma for picking the fabric up for me. It was on sale in Vancouver last weekend and usually I'm in Gibsons on the weekend. I don't leave unless I have to! After my quick and dirty refinishing job on the $5 end table, I was feeling like I should work on something that had been sitting for a bit. I pulled out the $1 shelves I picked up at the dump. 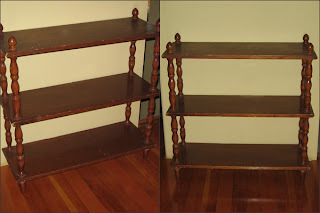 I had started sanding the shelves awhile ago but then got detoured. 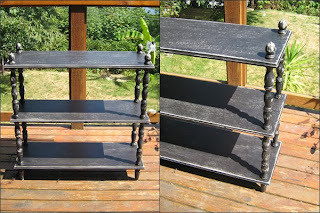 I took the shelves apart, sat on the deck and got busy sanding. So busy that I pretty much sanded off a bunch of skin from my left thumb tip! 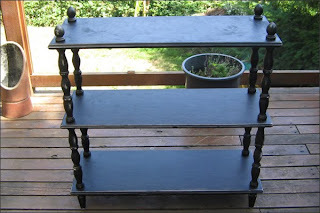 The spindles on the shelves were brutal for sanding but I really do not like shiny finishes on furniture so they had to be sanded. I decided to sand the piece then prime it and paint it a matte black. I'm now working on giving it a shabby chic finish. I still need to beat it up some more then I can seal it. Once I've got it to that point, I may add a simple stamp or stencil design. We'll see! I met my friend Asim last night. He dropped off the free coffee table he coordinated for me. 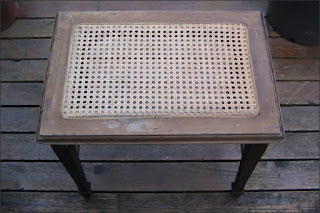 It's a gorgeous table just needing a bit of TLC - mainly sanding and staining. Next I'll have to transport it from North Vancouver to Gibsons. It's been a great week! We had a Salad Extravaganza at work on Thursday. There were 5 of us and each person brought 1 or 2 things towards a big salad that we then shared. I brought spicy pecans and a ripe avocado. The spicy pecans are part of an idea my Mom and I have for Xmas hostess gifts that include a bag of spicy pecans and a bag of curried nuts then I'll design and create the packaging. I'll need to come up with a design for the packaging - it has to be something re-usable. Anyways the Salad Extravaganza was a hit and there will be more! I also had lots of date time with Paul - always a very good thing. We picked tons of blackberries around our place Friday afternoon. We only walked about 20 feet and picked 2 big bowls full. We washed and froze those since they are FAB for smoothies for me and crumbles for him. Then we each had a project to sand. There we were on a Friday night on the deck sanding furniture - nothing says love more than that! 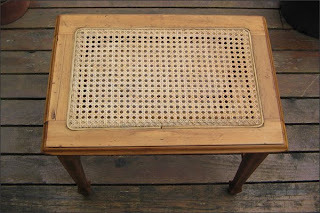 My project is this $5 end table I picked up on my thrifting adventure with Thelma this week. It was a quick and dirty fixer up job. I did an hour or so of sanding then today I added some wood oil then figured it was done. I thought of keeping the top au natural then painting the bottom white with a shabby chic finish but Paul poo-pooed that. I think he ended up being right (as usual) since the table looks great without doing anything too complicated. The legs had some texturizing effect to them that was hideous. I didn't fully sand it off so when I added the oil it actually left an interesting detail to the finish. I think it worked out well! That's me. The last few weeks I've had a thrift find to drag home. 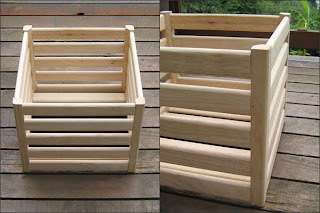 I bought 2 wood crates for $4/each. I took one home at a time. I got lots of compliments but needless to say I looked a little nutty. 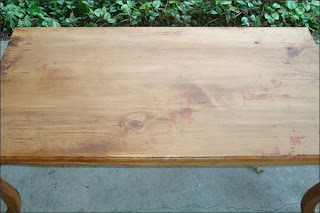 This week I dragged the $5 end table home. I sewed my first set of buttonholes. 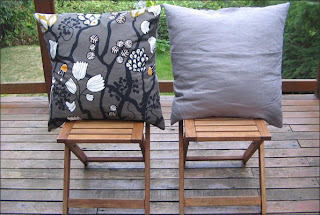 Here are my pillow covers using my $1 fabric from a garage sale and some new pillow forms I bought at the Lions Gate Thrift Store for $3/each. My other set of buttonholes weren't as successful - I'll need to rework them but at least I have tons of the brown linen I used. I didn't end up going to any garage sales today but managed to get to the Salvation Army and then the Happy Cat Haven sale. Both proving to be succesful. I spent a total of $10. 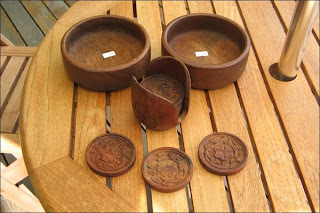 I picked up 2 more teak salad bowls for $1 and 6 teak coasters that came in a cute container for $2.50. Once I got them home, I washed them with soap and water then sanded them and finally added olive oil to them. 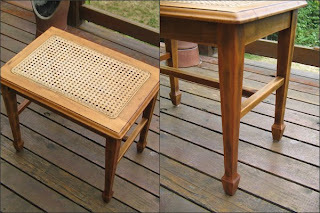 Teak housewares are easy to refinish since you just need to sand them and add oil. 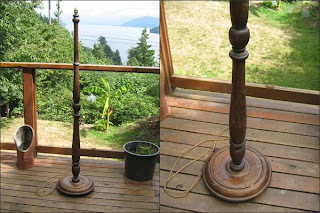 I bought another floor lamp for $7 - it's gorgeous. I got it at the Happy Cat Haven sale. It needs refinishing and definitely re-wiring. I'll also update the lamp shade. Lots of exciting projects on the go! 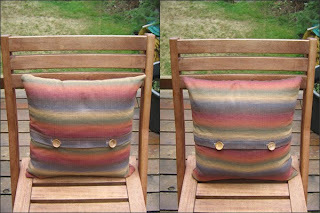 I also created a set of 14" x 14" pillow covers. I used some fabric I paid maybe $1 for at a garage sale. I thought these could be my first attempt at buttonholes then if I screw up it's no big deal. I'm glad I did some sewing this weekend. It was a little crappy out so it was nice to work on some sewing projects... Plus you actually feel like you can accomplish something in a short period of time unlike furniture refinishing. I have various projects in various stages of completion. 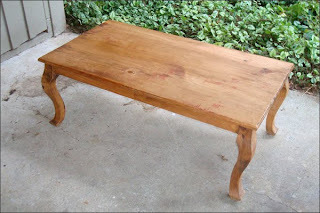 My friend Asim is picking up a free coffee table for me this week. A friend of his is moving and wanted to get rid of it - and he thought of me and my craft adventures. It just needs some sanding and a fresh coat of wood oil or stain. Gotta love free stuff! Tonight will be good - more buttons, making buttonholes, etc. 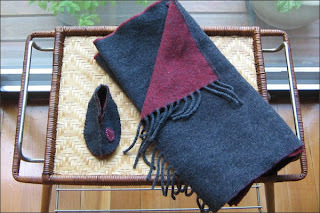 You know you're a bit nutty when you get excited about a wool scarf in August. Last week, we hit record temperatures for the West Coast. It was brutally hot - over 30 degrees, which is unheard of in these parts. So there I was in the Salvation Army yesterday and I picked up this gorgeous wool scarf for $2. I was pumped! I started cutting it up last night. I made a quick baby bootie. 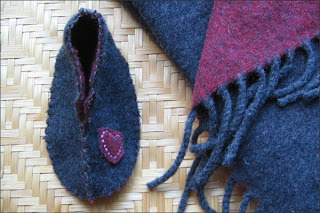 The booties will be nice with the grey on the outside and red on the inside. I might add a buckle or something along the top but I figure these will be comfy baby slippers. I found an option for my $2.50 stand. 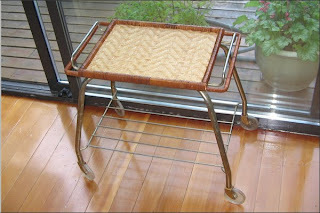 This tray fits perfectly on the stand. 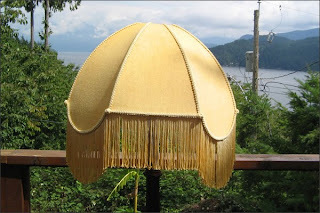 It was $1 at the Thrift Shop on North Road in Gibsons. It needs something... 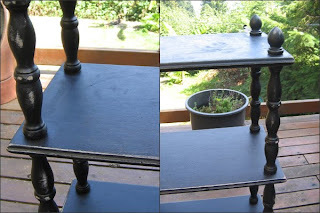 I ended up spray painting the tray black this afternoon. Tomorrow I'll tweek the paint then figure out my next step. I'm getting used to these trial by error situations. This afternoon, I painted over my white tray - the paint job wasn't as nice as I wanted so I'm back to basics for now.